If you believe in polls, then here is one for the record books. 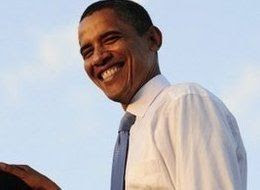 Barack Obama now leads John McCain in the latest Pew Poll by 14%. People now believe that he is hot on national security and is constantly increasing his lead on the economy. The polls show a 53%-32% lead there. People believe that he displays better judgment than McCain. Everywhere you go, you hear more and more confidence in the Democratic candidate. He's passed every test, and shows to be very knowledgeable in all the issues. With the newly found backing of Colin Powell, everyone seems to think that he is right where he needs to be just 2 weeks into the campaign. But wait... Just when he couldn't be doing better, an issue on the home front hits him front and center, causing him to put his campaign on hold for 2 days. Baracks grandmother Madelyn Dunham, 85, was released from the hospital late last week and returned to her home in Honolulu with a health condition the aide described as "very serious." Could that be a problem for him? I doubt it.. Barack Obama has now well over 130 million dollars in campaign pledges this month alone, and he has beefed up his television ad campaign to help take off the slack from campaigning for the next few days. One other poll. Sara Palin now appears to be having a negative effect on the McCain ticket. 49% have an unfavorable opinion of her where 44% have a favorable opinion of her. Just last month, the opinions of her were reversed, as almost 54% favored her, versus 32% that did not favor her. Lately there hasn't been any favorable news regarding the Republican ticket. The only thing they have left to do is to continue a negative smear campaign against Obama and Biden. Taxes, the economy and foreign policy should be front and center during the next few weeks, along with the constant attacks from Sarah Palin against Barack Obama.